BAGHOUZ — US-backed forces said on Sunday thousands of people were believed to still be inside the last Islamic State group enclave in eastern Syria, as they sought to flush out die-hard fighters with airstrikes and shelling. Tens of thousands of dishevelled women, children and men have streamed out of a small pocket in the village of Baghouz near the Iraqi border in recent weeks -- and they still keep coming. "Fighting continues as the #SDF advancing into Daesh encampment," SDF spokesman Mustafa Bali said in a tweet late Sunday. "Several positions captured and an ammunition storage has been blown up by our forces. SDF is now holding positions inside the camp in #Baghouz." But SDF spokesman Kino Gabriel told a news conference on Sunday that according to the latest group that quit the pocket, "an estimated 5,000 people" are still holed up inside. He cautioned, however, that the SDF has not been able to verify that figure. Those fleeing the pocket have previously reported widely inconsistent figures on the number of people still inside, ranging from thousands to a few hundred. "I hope it won’t take more than a week but this is a personal estimate," he said in the village of Sousa in eastern Syria. They include Europeans, Turks, Chinese, Iraqis and Syrians, it said in a statement. Ali Khalaf Ibrahim, an SDF fighter, said on Sunday that the jihadists were putting up a strong defence. "Several times they tried to infiltrate (SDF positions) with explosive belts but they were intercepted" by SDF fighters, he said. 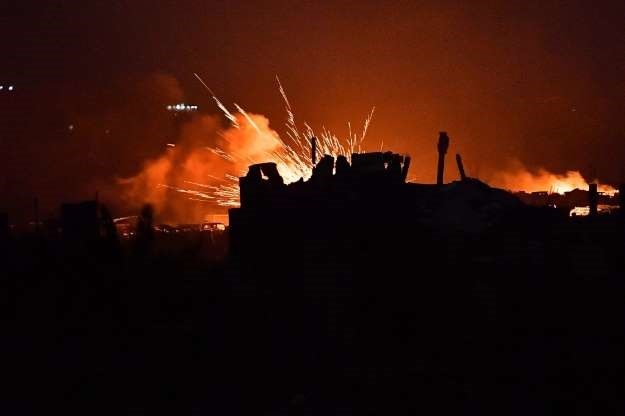 An ordnance left behind by jihadists exploded in the eastern province of Deir Ezzor on Saturday, killing 16 people and wounding 32 others, said the Syrian Observatory for Human Rights.